For years the UFC’s light heavyweight division has been a cast of familiar names ranging from twilight idols to dominant forces, with very few new contenders to speak of. 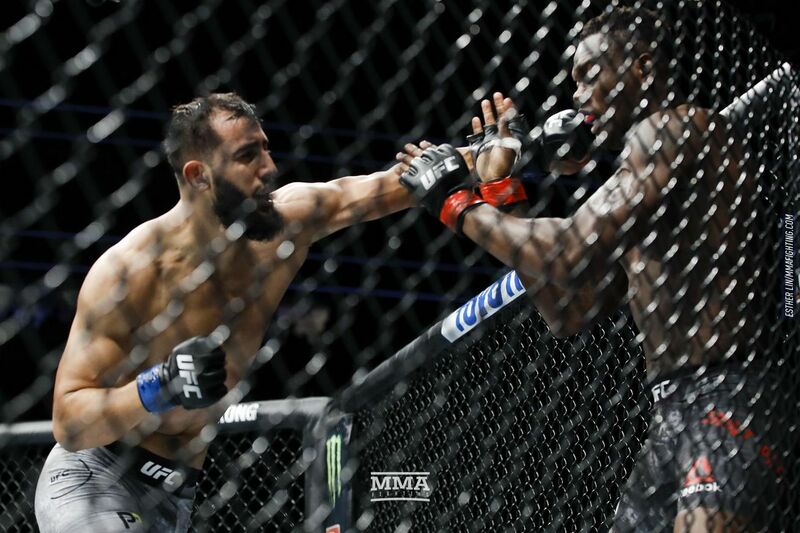 But after Dominick Reyes took out Ovince Saint Preux at UFC 229 in October, there was a shake up in the ranks. Reyes was within fractions of a second of scoring his fourth finish in four UFC fights, landing a huge shot at the very end of the third round that crumpled OSP where he stood. Still, it was an eye-opening victory on the most-watched pay-per-view in UFC history. Reyes dominated his showcase fight from horn to horn, displaying a deft ability to pepper Saint Preux with an elegant range of combinations. It was the first time in his UFC run that the 28-year-old Californian had to go beyond the first round, and only the second time in his pro career that he reached the third. The only other time a fight extended that far for Reyes was back in 2015 against Kelly Gray in King of the Cage. Otherwise, through 10 fights he has shown an incredible urgency to finish his opposition as quickly as possible. He did it in the leadup to the OSP fight when he scored the biggest TKO of his career against Jared Cannonier, a fight that occurred down in Santiago, Chile. Even with the impressive start to his career, Reyes — a former football player who has a very high fight IQ— says he understands why it took some highly publicized blastwork against Saint Preux to register him as a serious contender. “How can you gauge finesse? You can’t put a gauge on finesse,” he says. “I have finesse. I have flow. I have that little English…I can put that little English on it. You can’t gauge that. It is what it is, and if you’re a fan of me, it’s hard to really get behind me until a performance like this last one. And Reyes feels he is at the point where he’s letting the world in on a secret that he and his coaches have long been in on — the light heavyweight who can begin to overthrow the brand names of the division. Reyes, who next faces Volkan Oezdemir at UFC London on March 16, is coming up at the exact moment that things are aswirl at 205 pounds. Reigning champion Daniel Cormier, fresh off his heavyweight title defense against Derrick Lewis at UFC 230 this past November, vacated his light heavyweight title recently with the UFC planning to strip him anyway to keep the division moving. The vacant belt was recaptured by King 205 himself, Jon Jones, who submitted rival Alexander Gustafsson at UFC 232 to close out the year. While Jones is booked into his next title defense against Anthony Smith at UFC 235, Reyes is already looking ahead. After his victory over Saint Preux, Reyes said that he would like to challenge Jan Blachowicz in his next fight, perhaps sometime in the spring. Blachowicz, who has won four fights in a row himself, is another of the 205 pounders who is creeping into the rarefied space of contendership. By the end of 2019, Reyes believes he can be right at the top of the division, if he’s not holding the belt already. But the one thing he emphasizes is that the UFC’s light heavyweight division is in good hands with a definitive champion now defending the title, and guys like him coming up. He wants to return it to the glamorous destination that it once was. “I think the division will be just fine man,” he says. “There’s a lot of young guys coming up, but they’re having a hard time making it past the different levels. The vets in the game are still holding down their spots. The younger guys are trying to break in, and whether the moment’s too big or they’re just outmatched at the time, they’re not getting passed. As for who Reyes would like to topple when it’s his turn to fight for a title, he goes back to the original vanquisher himself, Jon Jones, the most beleaguered — and dominant — champion the UFC has ever known.